Ukrainian Prime Minister Volodymyr Groysman intends to ask the parliament to broaden the government's powers. 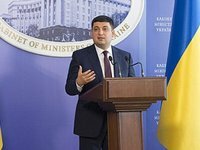 "I support the idea of establishing order in the country and want to say as prime minister, on behalf of the government, that we lack powers," Groysman said during government hour at the Verkhovna Rada. "I will propose amendments to the law on the Cabinet of Ministers to broaden the prime minister's powers. If you support this, I solemnly declare that I will establish real order in the country within three months," he said.